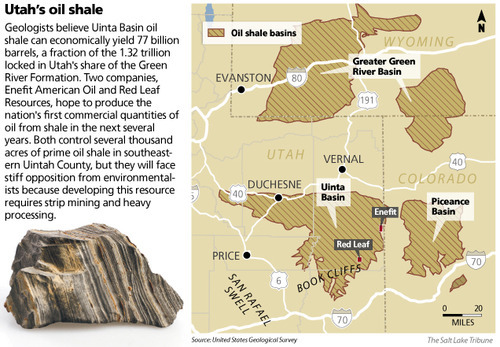 The rock that burns: Is Utah about to see oil shale bonanza? Green River Formation may dwarf Saudi reserves, but environmentalists are worried. Scott Sommerdorf | The Salt Lake Tribune Some of the tailings from oil shale on Enefit American Oil's White River mine on BLM land in eastern Uintah County, Wednesday, August 7, 2013. Scott Sommerdorf | The Salt Lake Tribune Enefit American Oil's mining engineer Ben France, left, CEO Rikki Hrenko, and Brian Wilkinson, right, talk at the second level of their "box cut" in eastern Uintah County that has revealed the prime level of oil shale they plan to mine from their site on private holdings, Wednesday, August 7, 2013. Enefit has already excavated tons of ore that has been shipped to Germany for testing. 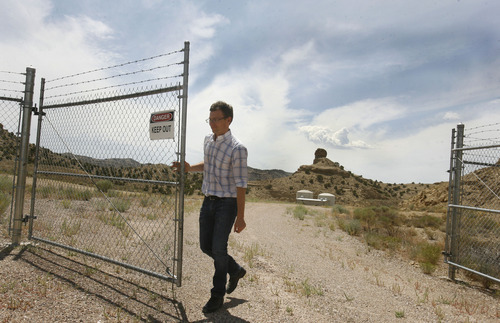 Scott Sommerdorf | The Salt Lake Tribune Enefit mining engineer Ben France opens one of the locked gates to their White River mine on BLM land in eastern Uintah county, Wednesday, August 7, 2013. The mine was developed in the '80s and abandoned in 1985 after the oil price crash. 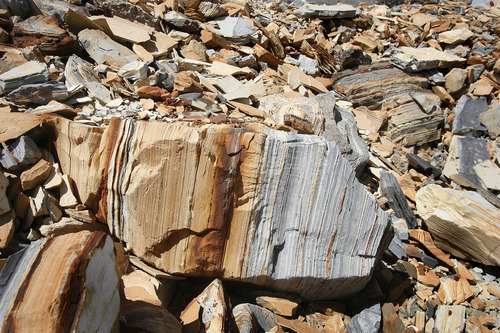 The Estonian state-owned company Enefit American Oil seeks to develop Utah oil shale. Enefit has already excavated tons of ore that has been shipped to Germany for testing. 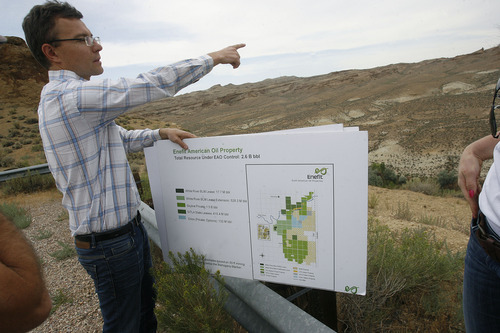 Scott Sommerdorf | The Salt Lake Tribune The Estonian state-owned company Enefit American Oil seeks to develop Utah oil shale in eastern Uintah County. It has already excavated tons of ore that has been shipped to Germany for testing, Wednesday, August 7, 2013. Scott Sommerdorf | The Salt Lake Tribune Enefit American Oil CEO Rikki Hrenko, center, stands next to a 1,000-foot concrete shaft at the White River mine on BLM land in eastern Uintah county with Enefit's Brian Wilkinson, right, Wednesday, August 7, 2013. The mine was developed in '80s and adandoned in 1985 after the oil price crash. The Estonian state-owned company Enefit American Oil seeks to develop Utah oil shale, and has already excavated tons of ore that has been shipped to Germany for testing. Scott Sommerdorf | The Salt Lake Tribune Enefit mining engineer Ben France gestures towards the darker, "mahogany zone" of the oil shale deposit revealed in their "box cut" on their private holdings in eastern Uintah County, Wednesday, August 7, 2013. The Estonian state-owned company Enefit American Oil seeks to develop Utah oil shale. 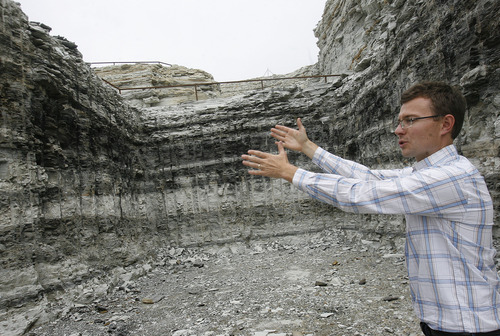 Scott Sommerdorf | The Salt Lake Tribune Mining engineer Ben France gestures towards an area near the White River that shows how the strata of oil shale fits into the geology of the area, Wednesday, August 7, 2013. 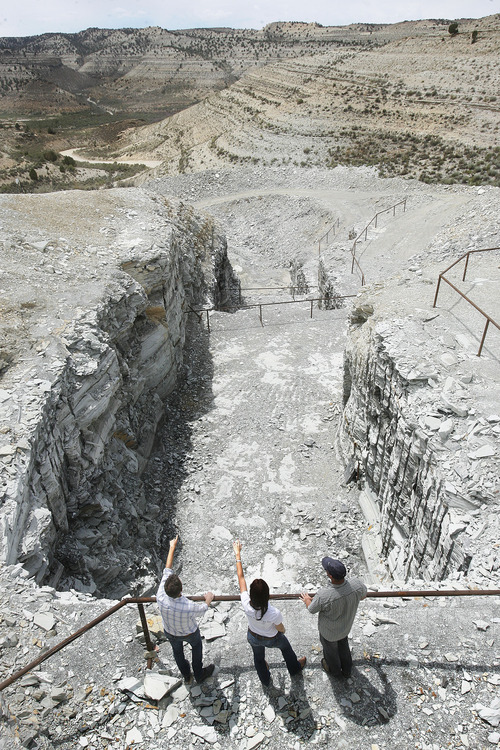 The Estonian state-owned company Enefit American Oil seeks to develop Utah oil shale. Scott Sommerdorf | The Salt Lake Tribune A page from an Enefit oil company brochure shows a plant in Estonia that will be like the proposed processing plant they plan to build on this portion of their 320 acre piece of property in the north end of their private holdings in Uintah County, Wednesday, August 7, 2013. Scott Sommerdorf | The Salt Lake Tribune Enefit oil plans top build a processing plant on this portion of its 320 acre piece of property in the north end of its private holdings in Uintah County. Scott Sommerdorf | The Salt Lake Tribune CEO Rikki Hrenko smells a freshly broken piece of oil shale that mining engineer Ben France holds. One can easily smell the oil contained within a piece of shale that comes from the "mahogany zone" of the shale deposit. Enefit Oil's Brian Wilkinson is at left, Wednesday, August 7, 2013. Vernal • The gash in the hillside recedes from a dusty road in 20-foot steps, revealing a towering bounty of hydrocarbons embedded in stone deposited 50 million years ago when algae-filled Lake Uinta covered northeastern Utah. Mining engineer Ben France of Enefit American Oil points out black streaks undulating horizontally across the walls of his "box cut" into what geologists call "the mahogany zone," dark rock rich in kerogen, a precursor to liquid petroleum locked in shale. People have squeezed oil from Western shale since the early 20th century, but it has yet to flow in commercial quantities despite untold millions spent on research and failed operations. Now, Enefit and another Utah operator called Red Leaf Resources, using a much different process, seek to bring industrial-scale development to a petroleum resource believed to dwarf Saudi Arabia&apos;s reserves. "There are a lot of different layers in here of different grades," says France, who supervised the excavation 40 miles southeast of Vernal to test the ore in proprietary "retort" process used for years by Enefit&apos;s Estonian parent company. France breaks some shale apart and the pieces emit the odor of petroleum, a potentially lucrative smell that has been breaking the hearts of prospectors for decades. The 60-foot seam Enefit is targeting will yield 27 gallons of oil per ton of ore, according to CEO Rikki Hrenko. In other words, the company is hoping to extract two-thirds of a barrel from every cubic yard of ore it plans to strip mine on the private portion of its holdings. By the 2020s, Enefit hopes to be shipping 50,000 barrels of sweet crude to Salt Lake City-area refineries each day. Billions of barrels • Nearly three-fourths of the world&apos;s kerogen-bearing shales occurs in the United States. Most of it is in the Green River Formation under northeastern Utah and neighboring territory in Wyoming and Colorado, deposited during the Eocene when vast lakes covered the region. Algae settled to the lake beds, blended with sediments, and transformed into kerogen, an "immature" hydrocarbon that becomes oil when heated. The federal government estimates these deposits represent more than 4 trillion barrels of oil and about 800 billion are technically recoverable  more than triple Saudi reserves. There is enough kerogen in Uinta Basin&apos;s shale to fill 1.32 trillion barrels. According to the Utah Geological Survey, however, "only" 77 billion barrels are economically recoverable, or enough to satisfy national demand for 11 years at current rates of consumption. While environmentalists deride oil shale as "dirty fuel," Utah&apos;s political leadership is eager to tap it. "It will be very good for the state. They [Enefit officials] are talking about 2,000 direct jobs," says Uintah County Commissioner Mike McKee. "When you are in mining, these become more permanent jobs. They are good-paying jobs. And you get a multiplier effect. Look at what those revenues and severance taxes can do for education and balancing the state budget." Environmental issues • Arguing Utah shale cannot be developed without devastating impacts on the landscape and choking the Uinta Basin&apos;s already-compromised airshed, environmentalists hope to kill this industry before it gets a chance to mature. Unlike conventional oil, shale must be mined, crushed and processed, then upgraded further before it can be shipped and refined. That consumes too much energy and water, critics say. "With commercial-scale development we are talking strip mining some of Utah&apos;s best backcountry and hunting grounds. It&apos;s committing to a final land use. It doesn&apos;t bode well for future generations," says Taylor McKinnon, energy director for the Grand Canyon Trust. "We foresee a need to transfer water rights from agriculture to this industry." Enefit officials say their retort uses no water although mine operations will require some water for dust control and reclamation. The ash-like spent ore will be returned to the pit and contoured as mining operations progress so only a few hundred acres will be open at any one time, according to Hrenko. Enefit&apos;s project area, combining state, federal and private land, occupies rolling terrain straddling the White River near the Colorado state line. It has been grazed and drilled in the past and is not considered much of a recreational destination. 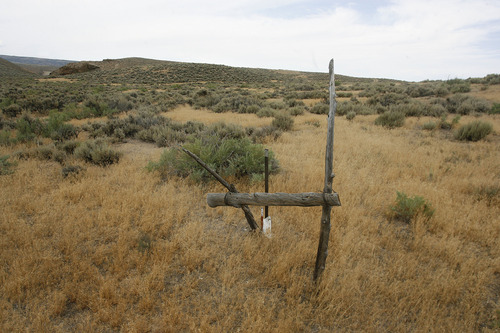 But the project area overlaps habitat for beardtongue, or penstemon. Two species of this wildflower grow only near Uinta Basin&apos;s oil shale outcrops and recently became candidates for listing as threatened species. Enefit&apos;s processing facilities will cover a 320-acre footprint connected to the Bonanza Power Plant and Chevron&apos;s under-utilized pipeline to the north. 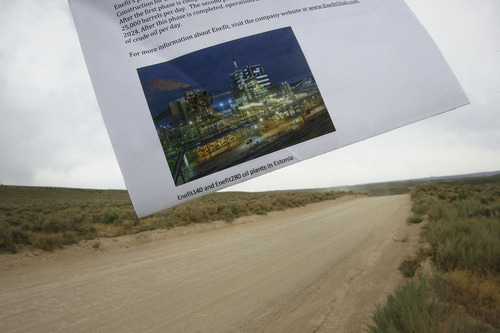 BLM is now conducting an environmental review of Enefit&apos;s proposed 19-mile utility corridor. The mahogany zone • A key question is how well Enefit&apos;s process will work on Utah shale, which differs from eastern Europe&apos;s shale deposited 400 million years ago in a marine environment. This shale contains far more water than Utah shale, is richer in hydrocarbons and is locked in a substrate containing different minerals. Enefit will use results from tests conducted in Germany to fine-tune its retort process. "A massive amount of work has been done. We&apos;re not re-inventing the wheel. Ironically, more research has been done in the United States than anywhere else. This resource is very well characterized," Hrenko says. "We&apos;ve produced first oil and we know its characteristics." Hrenko believes Utah&apos;s share of the Green River Formation is easiest to develop because much of the oil shale can be surface mined. Where depths exceed 350 feet, Enefit intends to extract the shale through room-and-pillar mining, which leaves 30 to 35 percent of the ore behind. To the east in Colorado&apos;s Piceance Basin, oil shale is so deep it can only be developed through unproven recovery processes where the shale is not mined, but heated up underground, or "in situ," over years and the retorted oil is then pumped out. That poses technological challenges, but the payoff could be enormous. "We have deposits in Colorado that are 1,000 feet thick, but a 1,000 feet deep. This is a huge resource per acre. You could have 1 million barrels under an acre," says Glenn Vawter of the National Oil Shale Association. "This is the land that is amenable to in situ processes." 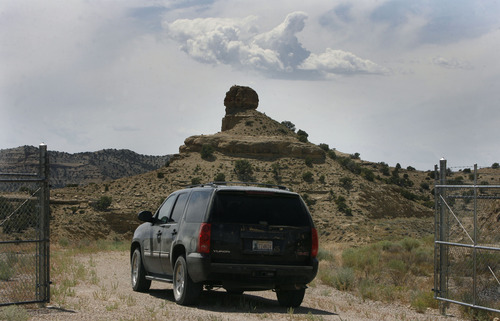 Over in Utah the shale band is narrower, but it breaches the surface in outcrops. Enefit took advantage of one such outcrop to expose its 60-foot target layer in three recesses. Near the middle a two-foot layer appears black, giving this dark deposit its mahogany moniker. This ore would yield 50 gallons of oil per ton, according to Peter Nielsen, curator of the Utah Geological Survey&apos;s core research laboratory. "The mahogany zone represents the highest lake level. That&apos;s when you had the most organic activity in the lake," he says. "After that you have less water flowing and it gets isolated, so it becomes more saline and there is less organic material." Retorting completes what nature started in Utah&apos;s Green River Formation when ancient algae formed the hydrocarbon material called kerogen. Under this Estonian company&apos;s retort process, shale is heated to 900 degrees Fahrenheit in a chamber using the rock&apos;s own kerogen as fuel. Through pyrolysis, the combustion of organic material in the absence of oxygen, the shale&apos;s kerogen vaporizes and then condenses into a viscous petroleum product. It is then run through an upgrader where hydrogen atoms are inserted under pressure. This process breaks a long molecular chain into shorter strands of hydrocarbons that remain liquid, allowing Enefit to pipe its oil to Salt Lake City refineries 200 miles away.